I’ve been saving this article for awhile because it’s kind of a long one, but I’m absolutely obsessed with it, so this week seems as good a time as any to share it. For more than a half century, researchers at the Institute of Cytology and Genetics in Siberia have been studying the process of animal domestication through research with a large breeding group of red foxes. With each generation of fox kits born at the facility, biologist Dmitry Belyaev and his colleagues have selected the most approachable babies, and these foxes have been bred with other approachable foxes for the next generation. By the mid-1960s—after only a few generations of selective breeding—the experiment began working beyond what Belyaev could have imagined. The new generations of fox kits were not just unafraid of humans, but they were actively seeking to bond with them. 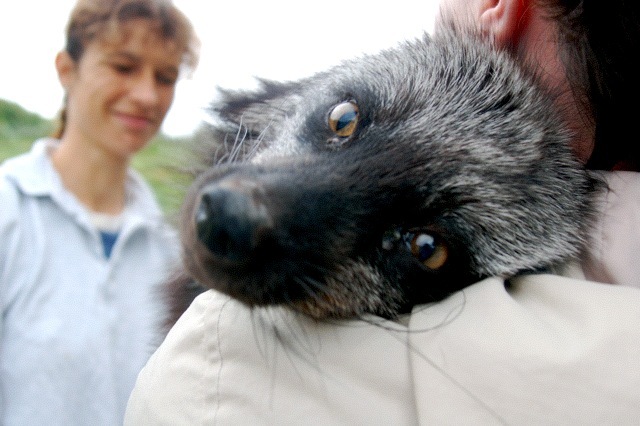 Their appearance was also changing, and the new “domesticated” foxes began showing floppier ears, curlier tails and mottled, unique coats of fur. The experiment is kind of wacky—in a “Big Brother” sort of way—but it also demonstrates how the process of domestication has shaped the lives of many of humankind’s most familiar animals, including dogs, cats, sheep, llamas, goats, pigs, etc. It also proves that domestication takes place on a molecular level. Written by LisaAnn On May 9, 2011 In "domestication", "genetics", "lisa ann o'kane", "lisa ann okane", "national geographic", "red fox"
Lisa Ann O'Kane is a young adult author and former vagabond who once camped out in Yosemite National Park for an entire summer, an experience that inspired her debut novel Essence (Strange Chemistry, June 2014).